But in fact duck fat is considered to be “healthy fat”. Professor Alejandro G. Mangaroni of the University of Guelph’s Department of Food Science is on record saying that duck fat has a lot of healthy monounsaturated fat that shields us from dangerous saturated fats. “All in all, duck fat is a good fat,” says Mangaroni. The reality is, not all fats are created equal. Some are downright bad (like trans fats in margarines), some are misunderstood, and some fats are health heroes. Our bodies need dietary fat (which is why many fats are called “essential”) in order to lose weight and function properly. The right kinds of fats help increase satiety, maximize your metabolism, protect against heart disease, speed nutrients through your body, and improve your fat-soluble vitamin uptake. Duck fat is a healthy cooking medium with many benefits. 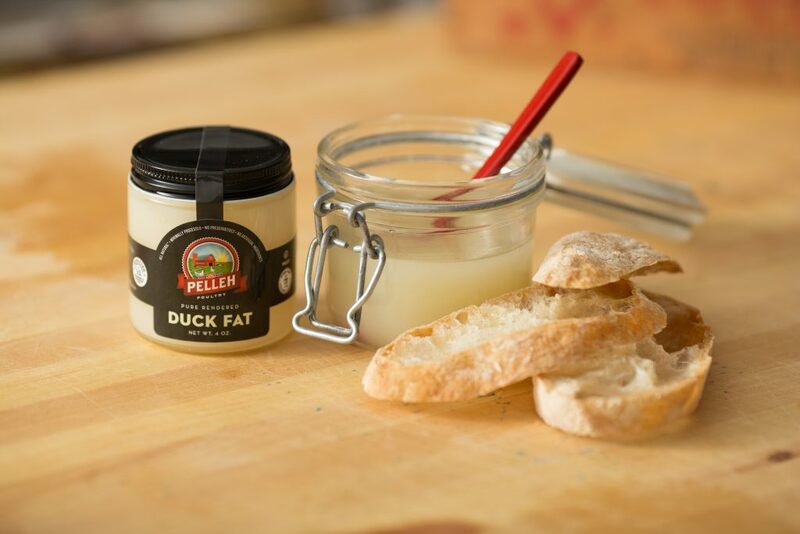 Duck fat contains linoleic acid which is extremely beneficial for cells, repairing and strengthening them. In fact, scientific studies show that linoleic acid can even help people suffering from chronic renal failure. Linoleic acid also helps the body assimilate calcium and it reduces preeclampsia, a problem affecting some expecting women, by 75%. So duck fat is a very good idea for anyone who wants strong, healthy bones. This is particularly true of women, who face higher odds of suffering from osteoporosis. Studies show that the monounsaturated fats present in duck fat is good for the heart and helps reduce high blood cholesterol. This reduces other health problems that are created by high cholesterol levels. Even more, a study by Dr. Serge Renaud, associated with the national Institute of Health and Medical Research in Lyons, France, shows that duck fat may also increase overall cardiovascular health. Duck fat is also high in antioxidants reduce premature aging, certain cancers and other diseases. Studies also show that the antioxidants and minerals present in duck fat, such as selenium and zinc, can strengthen the immune system. It is interesting to note that for many years Americans scientists wondered why the French tend to be thinner than Americans. This is odd since the traditional French diet is even heavier in fats from meat and butter than the typical American food regimen. In recent years researchers made the marvelous revelation that this is connected to duck fat, which is a hot food product in France. Even more, they determined that in southeastern France where duck fat is especially popular the average Frenchman suffers less heart problems than in the rest of the country. In the United States, 315 of every 100,000 middle-aged men die of heart attacks each year. In France the rate is 145 per 100,000. However, In the Gascony region, where goose and duck liver form a staple of the diet, this rate is only 80 per 100,000 This phenomenon has recently gained international attention as the French Paradox — They eat more fat in Gascony than anyplace else, but they live the longest . Professional chefs prefer duck fat for other reasons entirely. They report that there is no other fat that brings out the flavor of the dish the way duck fat does. Duck fat can transform a mundane and boring food into a spectacular delicacy, even foods that are otherwise unexciting yet healthy. For religious Jews duck fat has a special benefit, given that we are forbidden by Torah law to use butter while cooking meat. Professional chefs consider duck fat a perfect alternative for butter, because it it has the same qualities as butter, and adds the same depth of flavor as butter would. Another benefit of duck fat is that it has a high smoking point, the temperature at which oil begins to smoke and burn. When oil is heated past its smoking point it imparts a burnt flavor and unpleasant aftertaste to the dish. (The nutrients in the oil are also destroyed once oil is heated to this point.) The elevated smoking point in duck fat enables chefs to prepare certain foods more slowly to develop the proper taste. From the practical standpoint as well, the fat can be reused repeatedly to cook or fry more food without harming the flavor. Cooking with duck fat is kitchen alchemy at its tastiest. Chefs are especially excited about the exquisite flavor it imbues in their dishes, especially since duck fat does not have its own overpowering flavor. With a silky mouth feel, propensity for deep browning and delicate, savory flavor, duck fat spins anything it touches into culinary gold, from potatoes to poultry to popcorn. Duck fat is especially good for cooking and frying beef and poultry. It’s a surefire way to achieve an evenly browned, flavorful crust. Culinary experts say that no potato dish prepared with oil or other fats will ever compare to one made with duck fat. Duck fat enhances the earthy potato flavor and imparts a golden crust. Duck fat also makes an excellent dressing for various salads and is also great for oven-roasted or sautéed vegetables. Or, if the craving ever strikes, you can grab a slice of toasted bread and smear on a layer of rendered duck fat, just like Bubby used to enjoy, just as you would do with butter Add salt and pepper to taste for a delightful treat.